Adventure arrives April 5 with This Belongs in a Museum, a new tile-laying game that immerses you in the golden age of archeology. This Belongs in a Museum is the third installment in the Drawn & Quartered series of tile-laying games, and takes the core game system to whole new level. 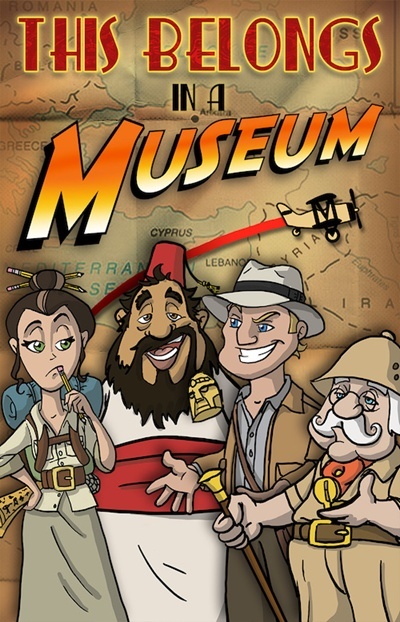 Building on familiar mechanics of laying, swapping, rotating, and replacing tiles, This Belongs in a Museum introduces new scoring opportunities with player action and artifact collection, as well as some new ways to increase your area of control in the play space. We’ve been receiving some great feedback from advance reviewers! We’ll let them answer the questions we know are on your mind! So what are you waiting for? Grab adventure by the horns and pre-order your very own copy of This Belongs in a Museum at your Friendly Local Game Store today! Check out the other titles in the Drawn & Quartered Series: Pirates, Ninjas, Robots & Zombies and Graveyards, Ghosts & Haunted Houses. Mark Streed from Boardgame Corner and Mike Richie, game designer for Rather Dashing Games, engage in an epic battle of Element. Boardgame Corner awarded Element its first-ever Cornerstone Collection award prior to the game’s release. A Cornerstone Collection award is granted to a game Boardgame Corner believes belongs in everyone’s collection. The Rather Dashing team spent March 13-17 at the GAMA Trade Show at Bally’s in Las Vegas. It was fantastic to see so much excitement for our new games, Element and This Belongs in a Museum! With Element only out for two weeks, we were thrilled to hear that retailers were selling out of copies quickly and reordering more in an effort to meet customer demand. 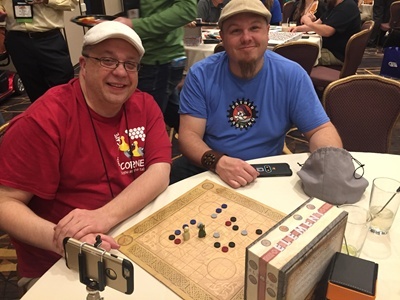 It’s obvious our 2- to 4-player abstract strategy game has developed a great fan base! Tim Kidwell of Rather Dashing Games explains This Belongs in a Museum to a visitor at our booth. Fans of adventure, archeology and tile-laying games were drawn to This Belongs in a Museum and its strategic game play. Figuring out how to connect your dig sites via airports, mountains and water as well as collect artifacts for more points kept the challenge level up. Game store owners we talked to thought this was a fun addition to the Drawn & Quartered series of games, which includes Pirates, Ninjas, Robots & Zombies and Graveyards, Ghosts & Haunted Houses. This Belongs in a Museum hits store shelves April 5. Rather Dashing Games art director Grant Wilson provides a demo of Element. At GAMA many retailers signed up for our email newsletter. If you didn’t get a chance to sign up for our newsletter list, it’s as easy as clicking here. Don’t worry; we don’t spam you with constant emails. We will let you know when new games are going to be released, though, and share other information such as special promotions and how-to-play videos with you. Enjoy some more photos from GAMA!